What ails Kathmandu Valley’s waste management project? KATHMANDU, Jan 24: A government-run project to manage waste from the Kathmandu Valley has failed to make headway for months. At the heart of the stalemate is the issue of managing 988 staffers of Kathmandu Metropolitan City working on waste management. Investment Board Nepal (IBN) and Nepwaste Pvt Ltd had signed a project development agreement in March amid much fanfare, but the work of collecting waste, segregating it, and processing the degradable wastes is yet to start. What has been done so far is – calling few meetings on resolving the issues of 988 staffers of Kathmandu Metropolitan City (KMC). Currently, these staffers are involved in collecting, transporting and dumping waste at the Sisdole landfill site managed by KMC since long. IBN and KMC officials have differing views on the matter that has hindered the waste management project expected to give valley denizens respite from stinking waste and dust of the street. Nepwaste has won the contract for package 1 of the project, which covers the different municipalities of Kathmandu district. Package 2 and 3 cover different municipalities of Lalitpur and Bhaktapur districts in the Kathmandu Valley, respectively. KMC officials say that the IBN is heedless to the KMC’s demand to get those employees hired by the developer company or providing voluntary retirement scheme. Whereas, IBN officials counter KMC official’s version stating that the KMC has intervened in the process of transferring its staffers to the developer company. 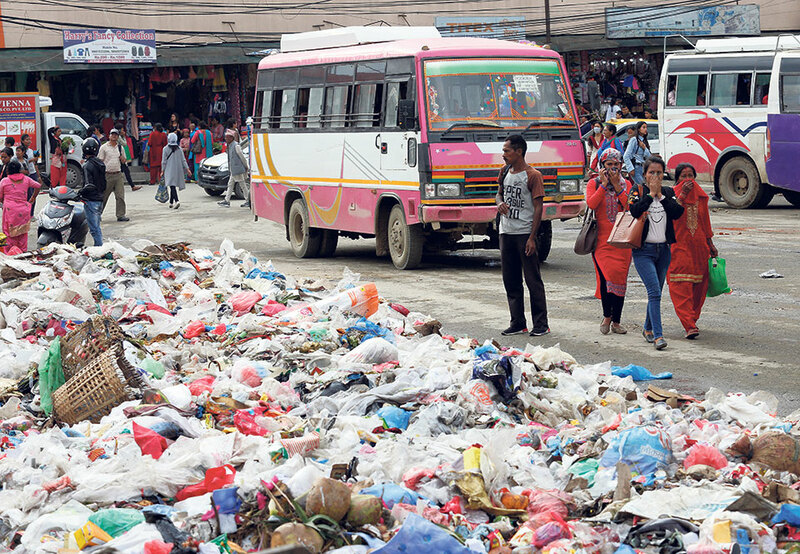 Hari Kumar Shrestha, head of environment and waste management division at the KMC, said that Nepwaste has denied hiring staff directly as it intends to hire them only after they are free from KMC. “This is not going to solve the problem anyway,” said Shrestha, adding that the KMC has to take care of its long-serving employees. He also said that the KMC cannot afford money to provide voluntary retirement to all those employees. The employees had staged protest at the KMC office two weeks ago to put pressure on the metropolitan office to decide on the fate of their job. These employees are hesitant to work for the private company fearing that they have to comply with rules that could be ‘stricter and unfriendly’. Talking to Republica, KMC employee Balaram Ranabhat, who is a truck driver carrying waste from Kathmandu to Sisdole, pointed out three reasons behind the project’s failure to take off: no job guarantee for the 988 employees, not bringing voluntary retirement scheme, and lack of access road to the waste disposal area. “IBN or the government should come up with a job guarantee at the private company for all these employees or bring voluntary retirement scheme for them,” Ranabhat said. He disclosed that the IBN was itself not ready to ask the company to start collecting waste from the city. The other reason holding back the IBN on the project is the lack of road to Banchare Danda, where the private company has aimed to deposit waste from Kathmandu immediately, according to Ranabhat. The IBN blamed the KMC for hindering the project by showing reluctance to sort out the staff issue. “We have had rounds of meetings with KMC officials but the KMC has put conditions on hiring those staffers by the company,” said Uttam Bhakta Wagle, spokesperson of the IBN. “The KMC has been saying that the company has to pay it the money for the employees’ salaries, and that it will manage those employees for the company,” said Wagle adding this is the point where the company has disagreed on hiring those staffs. Delay in starting works for package I has also stalled the negotiations for project development with Clean Valley Company Pvt Ltd, which has won the contracts of package 2 and 3.